This balun set transmits four analog HI-FI audio signals to a distant amplifier over a network cable. Connects directly to your equipment and no other video or audio cables are needed - only a network cable. Features: Can be extended up to 1000Ft with any standard CAT5/CAT5E/CAT6 network cable. 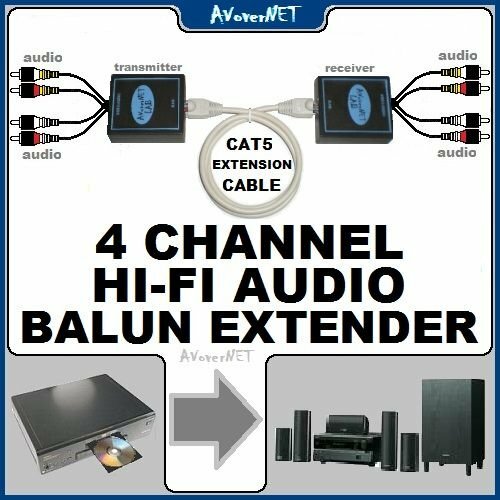 Once connected together with a regular network cable, baluns work like a typical video/audio cable but without signal loss. Our baluns deliver high quality video & audio signals at cable lengths that are out of reach for normal cables. Compatible with all DVD systems, Cable boxes, Satellite receivers, Game consoles, Home theaters, DVR systems, VCR systems, TV sets, Plasma and LCD/LED displays, Monitors, Amplifiers and all other video/audio equipment. No power required (completely passive). Work with all TV standards - NTSC, PAL, SECAM. Package contains: Two Baluns - transmitter and receiver. Audio specifications: Bandwidth 20Hz to 20kHz. Impedance 600 Ohms. Maximum Input 2 V p-p. Insertion Loss < 2 dB. Return Loss 15 dB or better. Common Mode Rejection > 60 dB. Connectors on transmitter balun: Four RCA audio plugs. RJ45 jack for UTP cable extension. Connectors on receiver balun: Four RCA audio plugs. RJ45 jack for UTP cable extension.